The Daily Telegraph is calling it “explosive”, the SMH has latched onto Gillard calling Bob Carr lazy. Ray Martin’s interview with Julia Gillard is being broadcast on Channel Nine at 7pm tonight (Tuesday), promising bombshell after bombshell and the whole truth. Unlikely! For the record, I agree with Wayne Swan and Stephen Smith that Rudd had become dysfunctional and needed to be replaced. They say, however, he should have been left in the chair until after the 2010 election, which he would have won. If history had taken that course Gillard would still be prime minister, we’d have the full version of the NBN, Gonski, NDIS and health would be funded into the future and we’d be heading for a surplus. Abbott would be historical detritus. But that didn’t happen and Gillard took over. Then Rudd should have left politics. If so, Gillard would still be PM we’d have the NBN, Gonski etc etc. Given that Rudd didn’t go away, early in 2013 after it became clear that Gillard couldn’t show her face in Western Sydney, she should have resigned for the good of the party. Probably we’d still have Abbott as PM, but it would have been the honourable thing to do. But what happened happened and we as Australians have to come to terms with it. The way we, the media, the Abbott led Opposition and yes, Kevin Rudd treated Julia Gillard is simply not acceptable in a mature, civilised society. We are all implicated in some way. That’s why I’ll be watching. The wound is still open. Previous PostPushing back the African exodusNext PostThe oligarchs are here and active in our midst! Rudd while having a good brain was always handicapped by his giant ego. The ‘gonski’ recommendations should have been implemented in the first term, because it was obvious as to what the ‘problem’ was but Rudd didn’t have the belief or the bottle to do just that. Thanks for your perceptions, wpd. I’d say you were in a position to know. 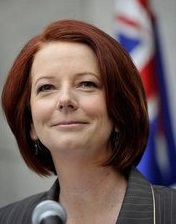 I thought Ray Martin did well and Gillard also acquitted herself well. From the interview and Swan’s book it looks as though Rudd was at least in control of the leaks during the 2010 election. If so, I’d agree with Swan, leaking against your own party during an election is unforgivable. I think it’s well enough established now that Rudd’s style was quite unsuitable for a PM. Swan says in effect that from about three weeks before the Copenhagen climate conference in 2009 Rudd was on another planet. wpd: I choose to disagree in part. Rudd’s whopping big ego was merely a shield, a necessary shield. He was an Outsider with talent in a relatively stable organization where almost everyone played the Faction Game – and it was and still is a Game where everyone plays at politics instead of working at politics. All the players expend so much of their time and effort playing the Game that the ALP has abandoned any claims it had to being The Opposition; they have surrendered or chucked away that task and The Greens have picked it up. Rudd was doomed from the start; organizations like that hate and fear Outsiders with talent, especially if such an odd-man-out demands reform and demands that everyone work the same hours and under the same stresses as do many ordinary workers in 21st Century Australia. I’m amazed that he managed to get as far as he did. Unfortunately, I missed the Gillard interview. That doesn’t matter at all because the Ministry Of Truth will tell me what to think about various snippets taken out of context and explained for us proles and boagans.